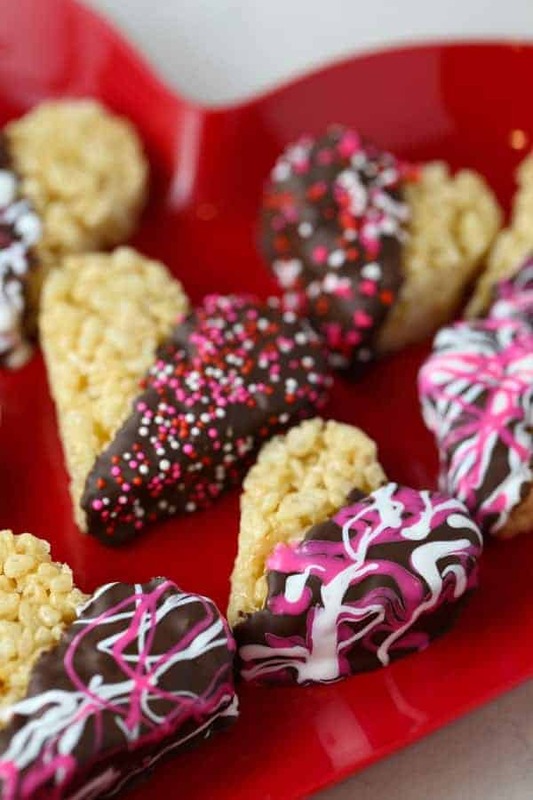 Chocolate Dipped Rice Krispy Hearts are rice krispies treats cut into hearts and dipped in melted chocolate. Perfect for kids to make! It’s almost Valentine’s Day, do you know what you’re getting for your sweetie? 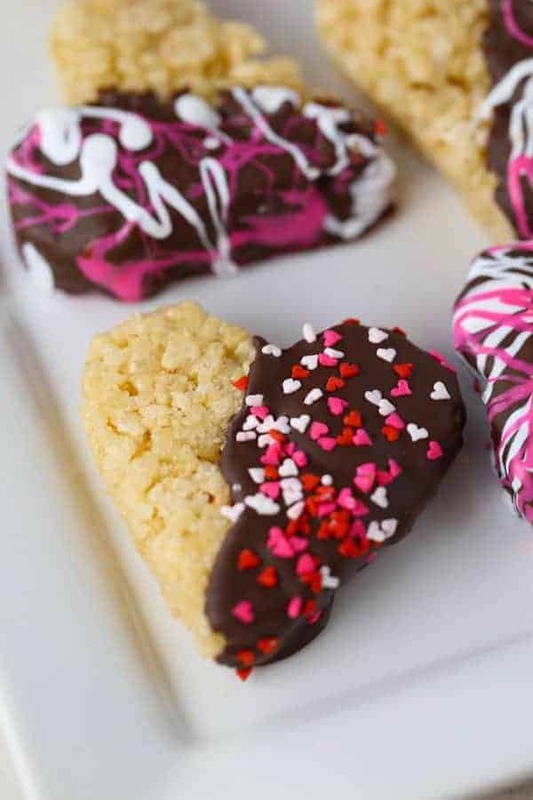 Instead of buying chocolates, why not make a homemade treat! Homemade gifts are a wonderful way to say I love you! 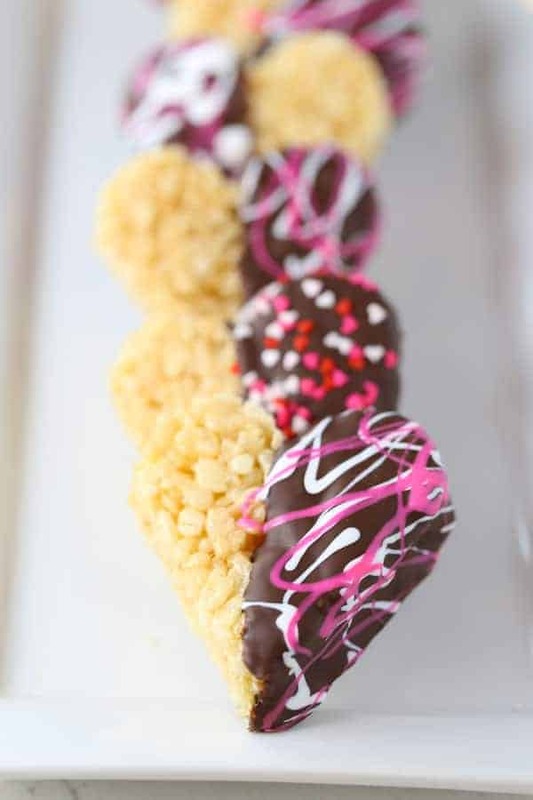 These Chocolate Dipped Rice Krispy Hearts are very simple to make and also a lot of fun! 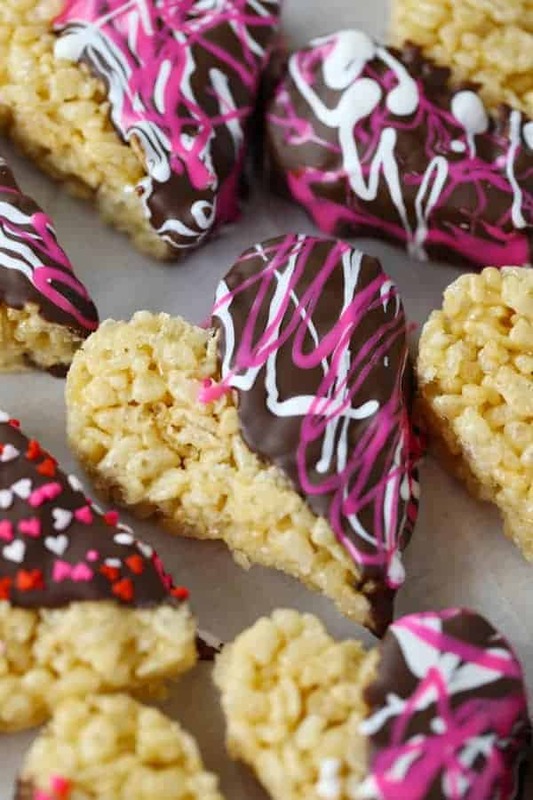 If you know how to make rice krispies treats, then you’re halfway there. 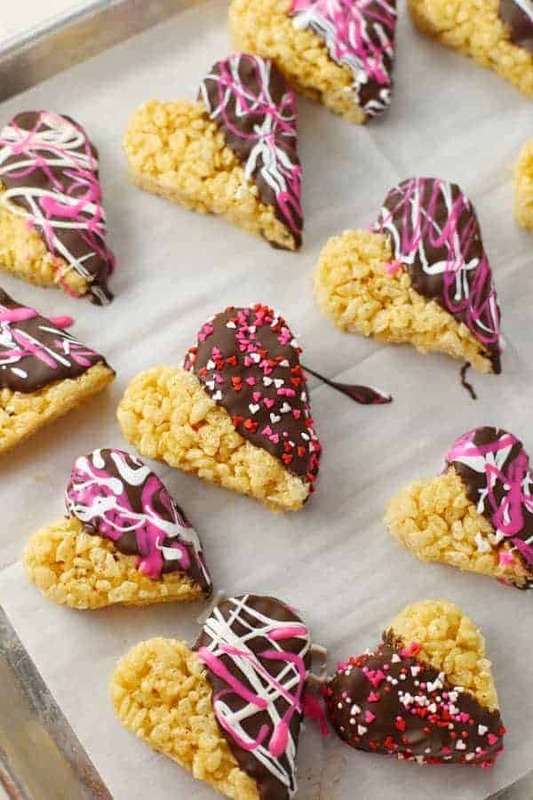 All you do is make a regular batch of rice krispies treats and let them cool. 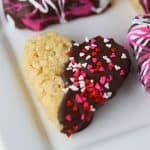 Then cut into hearts with a cookie cutter. 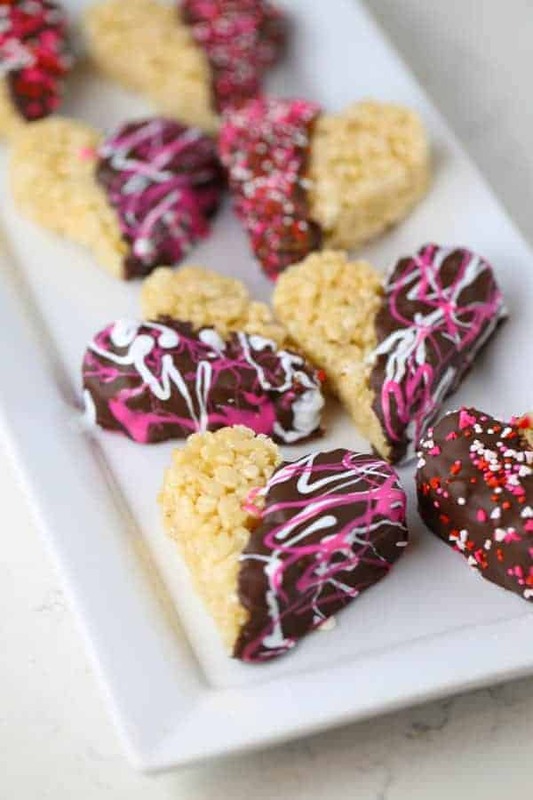 Dip them halfway into melted chocolate, then add sprinkles OR you can create a “splattered paint” look with pink and white melted candy melts. If you do this, you have to work quickly. Make sure you have your semi-sweet chocolate and your candy melts already melted before you start dipping. Just follow the package instructions for melting and don’t over heat the chocolate or it will burn. 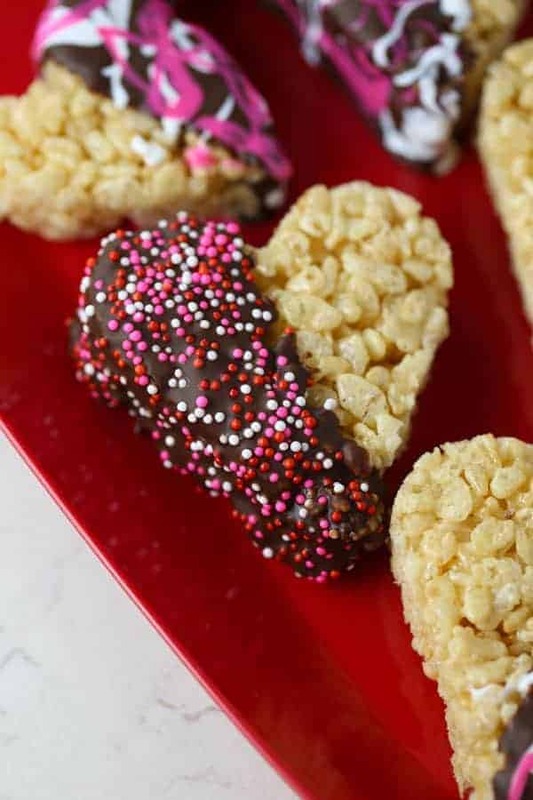 These Chocolate Dipped Rice Krispy Hearts would look so cute on a platter wrapped with clear plastic wrap or you could put them into individual treat bags and tie with a ribbon. Either way, they make a great little gift for your sweetheart! I did a LIVE demonstration of how to make them on my Facebook page and you can still watch it here or see below for the recipe. Melt the butter in a large, heavy saucepan over medium heat. Add marshmallows and stir until melted. Remove from heat and add cereal. Pour into a 13x9 cake pan that's been sprayed with non-stick cooking spray. Press down into pan and smooth the top with a spatula. Let it cool. Cut into hearts with a cookie cutter. Melt the chocolate and candy melts according to package instructions. Add a few teaspoons of oil to chocolate to make it easier for dipping. Add more, if needed. Add some oil to the candy melts too. 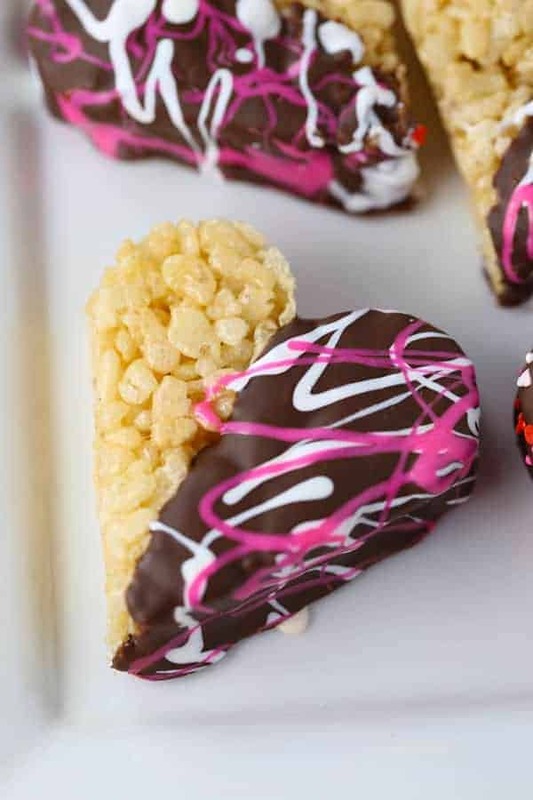 Dip rice krispy hearts in chocolate, then drizzle with candy melts. Or add sprinkles, if desired. Makes about 20 hearts.